The Paranormal is not an area that I spend a lot of time on, In fact, I try to stay away from most paranormal issues. There are a few exceptions that I have given some time and thought. One issue That may prove to make a very profound impact in the future is the Monuments in the Cydonai region of Mars and the possible ruins on our moon. Another interesting phenomena, which will be introduced toward the end of this page, are the stories of captured UFO's being reverse engineered. We will first look at the evidence supporting the existence of monuments in the Cydonai region of Mars and the ruins on the surface of the Moon. Then, assuming that the data supports the existence of these non-natural structures we will look at possibilities that might explain how these structures might be explained within a Biblical context. The above picture, and two of the three pictures below, were provided by Mark J. Carlotto. He has an amazing collection of pictures which he processed himself. He is acknowledged as having produced the best processed picture of the Cydonai region. His original web site is nolonger on the web. However, there are other sites that continue to show what is happening. The most distinctive object in the Cydonai region is the actual face. Initially, in the 1970's, there were about five different pictures that contain the face. Two of the five, which are shown above, are closer and sharper than the rest. These two pictures were also processed by Mark J. Carlotto. Today there better pictures that have greater detail then what is seen above. They can be viewed by looking at the various links on this page. There are also many other objects in the Cydonai region, such as a 5 sided pyrimid, a structure called the fort, which I think could be unfinished. It looks like the builders wanted to build a structure in the shape of a triangle. It is only partially completed. So I wonder if the builders might have run out of time. The idea that a structure isn't finished yet does not usually enter into the minds of those who think in terms of millions and millions of years. On the other hand, the idea that the structure is unfinished fits in very nicely with short time synario of Biblical history. Read the Biblical Explaination below on this page for more information. The orientation of the objects seems to be very important. The actual placement produces certain angles which apparently occur over and over at the site. To gain further information concerning some of the other aspects of Cydonai, try the following web sites. It may take some digging in some of these sites to find what you want to find. Richard Hoagland's site has been developing their theories to the point that they have become very complicated and involved. 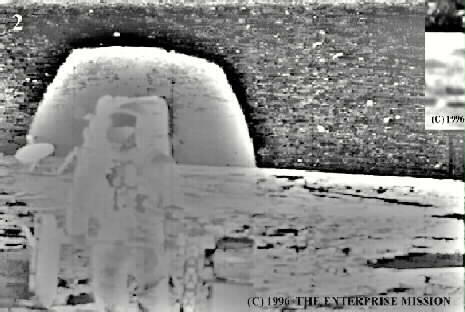 The above picture originally had a totally black sky in order to properly expose the foreground with the astronaut and moon surroundings. This picture is one of many that have been shown by Richard C. Hoagland of The Enterprise Mission. It has been overexposed to try to pick up any possible structure in the black sky. As you can see there is what seems to be a broken? dome, and in the surrounding portions of the sky, we see a lot of what seems to be junk or noise in the photo. Hoagland through a number of photographs, shows that this detail found in the sky is common among many of the moon photos. You will see close-ups of towers and other structures on the Moon. Go to his web site and follow the logic of his argument. He has a lot of data. Moon Photos The web page where the above photo came from. In this comparison, the best Viking image has been enlarged to 3.3 times its original resolution, and the MOC image has been decreased by a similar 3.3 times, creating images of roughly the same size. The left image is a portion of the old Viking image, the middle image is a portion of the new MOC frame shown normally, and the right image is the same but with the contrast reversed. These three in one photo was posted on the Art Bell's home page courtesy of Malin Space Science Systems. The new images are the first new information in 20 years. Because of it's poor quality and it not being what many people expected, the image is controversial. You can expect to see a lot of activity from the Cydonia Mars sites that are linked on this page. Go to them and see what is being said about the new data! The following links are suggested. You might especially want to look at Richard C. Hoagland's web Site, The Enterprise Mission. He has done some research of the recent NASA picture of Cydonia and says he has found positive proof that NASA has been messing with the pictures before we got them! NASA says the strip photo is raw data. Not so says Richard! If he is right, this could be a clear case of having a lying NASA to keep us from the truth on Cydonia. The evidence is literally astounding! Most other issues involving extraterrestrials seem a bit far fetched. Someone gets abducted, or sees something. So he/she calls up the authorities. The authorities listen and give them a balloon story and then say, don't call us, we'll call you. Even the newspapers mostly ignore the majority of the sightings (unless half the town sees it). Why is the government more calm about space ships than we are? About the only place to hear about this kind of thing is late night radio. Everyone has heard of the totally bizarre and weird stories broadcast during the night. It's not exactly the place I want to go for my information. The pictures from NASA and the computer processed enhancements are an entirely different category of data. The pictures represent the very best data there is of structures on other worlds. We are not looking at hear-say, but computer-enhanced data from none other than NASA itself. The researchers who have put the data together in the above web sites obviously see many possible explanations to the existence of these ruins. Almost without exception do they embrace the usual Evolutionary long ages as the framework of their theories. Most of the theories involve extraterrestrials. Some even involve Mankind, they think our own ancestors could be responsible for the ruins. Still others think it is possible that mankind actually originated at some other place and we were seeded here on Earth by a race like our own or even from E.T's. Some of these ideas seem really far fetched. However there is a serious concern by many that the ruins on Mars and the Moon represent a reality that the world will have to come to grips with sooner or later. Some think it possible that the UFO threat is somehow connected with the ruins on the Moon and Mars. Some even wonder if the threat actually represents the end of any future for Man. In the mean time mainstream science seems to be doing its best to ignore the evidence of the various anomalies found in the NASA photos. NASA itself declares the images of the various ruins or monuments to be tricks of light, or some other phenomia. What is suspicious, is that NASA doesn't seem to want to use it's newer Mars orbiting satellite to take better pictures. It says it has better things to do with it's time. In addition, NASA seems irritated over the issue, that so many are picking up on the controversy. NEWSBREAK!! People and organizations for the last couple of months have hounded NASA to the point that they at least say they will try to get more photos! However the poor quality picture they gave us does not represent what the satellite is capable of at all. In fact the on purpose poor quality of the photos seems to suggest that NASA really has found something but doesn't want us to see it. The Enterprise Mission look in this website for info on the latest developments at NASA! The actions of NASA is attracting attention to these sites. Many think that NASA and the government is actually trying to hide any evidence supporting the reality of the unnatural nature of these sites. It does seem that NASA is acting strangely. Why doesn't NASA just produce better pictures and be done with it. If it thinks that there is nothing to the sites. Thats the million dollar question. I think NASA would gladly take the pictures if it thought it would solve the problem. But what if NASA seriously thinks there is something strange at these sites and it realizes that a picture might produce a lot more heat on the subject then they want. Is this possible? Many have looked into some of the historical documents of NASA and have actually found a document that suggests a reason for NASA's behavior. Explore the following sites. The McDaniel Report Explores the Brookings Report and other Documents. Apparently there has been much thought to extraterrestrials by the government. It also seems that NASA seems to be following the script by it's refusal to officially look again at the structures. I can also envision the possibility that the UFO phenomena is real, something that the government is trying to keep under raps. At times the government seems to do a very poor job at covering the evidence of a sighting. Simple explanations such as weather balloons are almost given like a broken record. Also men in black suits and sun glasses are seen investigating. Many times the investigation is extremely visible. It seems that the government wants to slowly raise people's awareness of UFO's and the like while keeping the specifics away from the public. In short, our government could be conditioning the public for the time when the UFO phenomena will be forced on the public, even possibly against our government's wishes. This scenario, of course, is dependent upon the idea that there really is something to the UFO phenomena, the monuments of Cydonia, and the ruins on the moon. For the moment we will assume that the structures seen at the top of this page were constructed by some intelligent race. Who made these structures? Is it possible that some group of extraterrestrials built the structures? Or, did we in our distant past go to other worlds of the Solar System to construct these wonders? I want to explore in the Bible for any answer to these questions. Does the Bible tell us that extraterrestrials live in other worlds? The following text in the Bible indicate that a meeting occurred in heaven. It must be in heaven because there is no record of God ever having regular meetings with the sons of God on Earth. It certainly doesn't sound like this event occurred on Earth. In addition we find that there is an extraterrestrial, who is not from this world, who indicates to the body present, that he is the ruler of the earth. In the Bible, his name is known as Satan. Apparently he should not be there. At least it sounds like he is uninvited. "Now there was a day when the sons of God came to present themselves before the LORD, and Satan came also among them. Apparently this was an important event, probably an activity of the Universal Government of God. In this meeting the sons of God are presenting themselves before the Lord. It seems that all who were there, except one, had a right to be there. At least we don't have any record of God questioning their presence. There was one though, who was not invited. When God asked Satan why he was there, he essentially answered: from walking around on the Earth. Is Satan claiming ownership? I think so, Satan seems to conclude that he either owns or rules our world. He is actually claiming ruler-ship of the Earth! That is why I think he went to the meeting. He sees himself as the leader of the Earth. This meeting most likely is a meeting of the leaders of the Universe with God; So Satan felt he had a right to be there. And the LORD said unto Satan, Behold, all that he hath is in thy power; only upon himself put not forth thine hand. So Satan went forth from the presence of the LORD. Job 1:8-12. If the discussion wasn't concerning ownership or rulership of the Earth; then, why does God answer Satan's statement of walking over the face of the Earth, with: "Have you considered my servant Job. . ."? In this discussion, Satan apparently says he has control of the Earth. So God begins questioning Satan's claim by pointing his attention to Job whom Satan is not able to control. God emphasizes the fact that Job is upright, just and he fears God. I can imagine that Satan here begins to squirm as he essentially says: Well of course Job likes you. You give him everything he wants, why wouldn't he like You? So God tells him: OK, I'll let you try. We'll see who really is in control, but you can't touch him. If you read the book of Job, you will see that Job does not know a thing about this discussion. He is clearly having a hard time with the reality of his bad fortune. In addition he is forced to consider, from an earthly point of view, why all sorts of bad things are happening to him. Satan seems to be controlling all Job's personal friends as well. If there was anyone who should be considered a son of God on the Earth, it should be Job. He was the very one whom God chose as His example. Job was God's man. If the meeting was held on Earth, Job would have been at that event. In addition, if the meeting was on Earth, then why does the ownership of the Earth come up. Do the others present claim ownership or leadership as well? If these other members present are all from the Earth and ownership was an issue, then Satan's right to be there would be by default, deny the right of all the others to be there. When has God ever set up a government on Earth with leaders that He met with regularly? No, this meeting wasn't on Earth. If we can even pretend what other dwelling places are like in the Universe, we could say that this meeting was held on another planet or possibly where heaven is. So, we most likely are looking at a meeting of extraterrestrials. Each member at the meeting is a representative of their own world. A system of government for the Universe that God Himself oversees. A second meeting of the sons of God with God is described in Job chapter two. Again the same issues are brought up but with slightly different specifics in the arguments. Satan failed the first time around so this time he is calling fowl. He still claims the Earth as his and he wants even more power in trying to force Job to obey him. Read the account and see what happens. So went Satan forth from the presence of the LORD, and smote Job with sore boils from the sole of his foot unto his crown.Job 2:1-7. We can see from the actual text that Satan still claims the Earth. It seems that Satan believes that if all people were under his control then the Earth would rightfully belong to him! There also seems to be some truth to Satan's claim since God counters Satan on the very level that Satan is thinking on. It seems that these meetings are a regular event and here, God counters Satan's claim by pointing to Job which Satan was unable to control. God adds to what He said before by stating: he still holds to his integrity. Also very interesting, we see that God takes the blame! He doesn't say that Satan is moving to destroy Job but He says that you have moved me against him, to destroy him. It is clear that God is the supreme commander but yet there are some things here that don't make sense. If God is really the source of all love like Christians say, then why would He allow Satan to wage war against Him or to even allow Satan to exist? Is God playing games? Or, is God too weak to destroy Satan? We need a little background information to make better sense of the situation. Some of the following answers to the questions contain some clues as to why we see God and Satan in opposition to each other. Does the Bible Tell Us that Extraterrestrials Have Ever Visited the Earth? And Are These Extraterrestrials Dangerous? Behold, I give unto you power to tread on serpents and scorpions, and over all the power of the enemy: and nothing shall by any means hurt you." Luke 10:18-19. It doesn't take much reading of the Bible before an awareness, that some supernatural power seems to exist on the Earth, whose very purpose is to destroy and hurt us. They are extremely evil. In the above scripture (Luke) Satan, once called Lucifer, is connected with the power of the enemy being represented as serpents and scorpions. Fortunately, Jesus has given us power over these extraterrestrial visitors. We do not have to be harassed or threatened by them. There are many places in the Bible where we are assured of help. Luke 10:19 in the above text, is just one small indication of the help that is at our disposal. We don't have to be threatened by the extraterrestrial threat at all. Any part of it! Below is a story where Jesus Himself confronted some extraterrestrials who are followers of Satan. Satan did not come to our world alone he brought along a large group who easily have many powers that we do not have. Yet they are no match for the Monarch of the Universe and the Lamb of God. According to the Bible, these demons are extremely dangerous having powers far beyond our abilities. All through the Bible there is an ever present power that is determined to destroy man. I am convinced that they are behind all the strange phenomena that we classify as the paranormal today. We definitely "are not alone". Here are some text that state the reality of these extraterrestrials and also their purpose on this world. For we wrestle not against flesh and blood, but against principalities, against powers, against the rulers of the darkness of this world, against spiritual wickedness in high places. Ephesians 6:11-12. Again, the Bible teaches that we are not alone. We are not just wrestling with our own problems, we are wrestling against powers that we are not able to readily recognize. These extraterrestrials are the source of these dark forces. They are also the source of most of the evil we have in our world. It is only by putting on the whole armor of God, by being sober, and vigilant that we will be able to stand against the devil and his sinful darkness that threatens us as well as the whole world. It seems like we are in a war! Well if the Bible has any truth in it, we would have to assume that we do find ourselves in a war. An intergalactic war! Is There Evidence of an Intergalactic War? 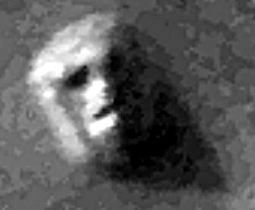 Anyone who has ever seen a ghost, or even demons come out of a person, or who is wondering how the face on Mars ever got made, and countless other phenomena such as the ruins on the Moon, UFO's, abductions, animal mutilations, astroprojection, etc. ; will only wonder what the big picture is. What is the true story behind the phenomena we see around us? Do we take all of these things at face value and conclude that we are being visited by beings of other worlds (E.T's.) or is there major deception involved in the paranormal? Is there some force or group that is responsible for all of the paranormal we see today? Could there be some organized strategy that an extremely powerful extraterrestrial group could use against the government of the Universe? The Bible gives us a clear indication that there has been a war in Heaven and that this war was brought down to our planet. Somehow we have become the center of this conflict. In the story of Job, we saw that Job's actions played a very pivotal part in the outcome of Satan's status. Somehow, this intergalactic war of the Universe which started within the highest levels of God's government has become a battle over morals, the morals of mortal man. In the bits and pieces of the following scriptural text, we get an inkling of the series of events that must have happened. In the beginning of this story, there was an anointed cherub, originally named Lucifer, who lived in the very presence of God. He must have been central to the Government of God over the entire Universe. Sin, another name for rebellion, originated with Satan! When Lucifer became jealous of God and His power, he began a movement in Heaven that sought to overthrow God. In this process, Lucifer became Satan or the Devil. Ezekiel the prophet in the above quote said that God found Satan profane, he was evil, so He promised that He would throw him out of Heaven and then destroy him. Knowing that these beings have greater abilities than we do, we must only wonder what the battle was like. The sides are clear enough, Satan and his angels fought a war against Michael and His angels. Who is Michael? We also have a clue as to how many of the angels of heaven became the demons and devils of today, along with Satan. If this statement is understood correctly, a third of all the angels of heaven cast their lots with the dragon or Satan. We are looking at a major disruption of the government of heaven. A major portion of God's people in heaven actually sided with Satan. If a third of the angels chose to follow Satan then we can only wonder about the other angels and beings in God's kingdom. Are they 100% behind God or are they wondering who is the better King? Is this why God spends time confronting Satan's threats? Is God shoring up support by allowing His people see first hand what the issues are? If there is not some important reason why God doesn't destroy Satan and his followers outright then we can only conclude that God either doesn't care about us or He is unable to help us. Let's look at more evidence concerning Satan and his movement. Below, in the following scripture, we see the aspirations that Satan had wanted from the very beginning. He wanted the power of God. Through the process, Satan lost his love for God and for others. How Did We Get Mixed up in This War? I think that battles on our own world tell what the original war was really about. Before we get into the specifics of why Satan chose to invade our world, let's look at some supporting evidence first. According to Scripture, God is the high and lofty One that lives for ever. He is God! For thus saith the high and lofty One that inhabiteth eternity, whose name is Holy; I dwell in the high and holy place. Isaiah 57: 15(first part). We also have scripture that state that God created all things. For he spake, and it was done; he commanded, and it stood fast. Psalms 33:6-9. But how did He create things. Yes, Psalms says that God spoke. But what I am really asking is: Does God create by Himself, alone? The following text is interesting in that it suggests that God the Father did not create alone. But to us there is but one God, the Father, of whom are all things, and we in him; and one Lord Jesus Christ, by whom are all things, and we by him. 1 Corinthians 8:6. Paul states the same thing about both The Father and Jesus: "by whom are all things". Except that Jesus is more physical (NKJV says it a little better: through whom are all things). Maybe when God the Father said something, Jesus did it. They must have worked together. I especially like the next verse because it suggests to me the interaction that The Father and Jesus must of had when they created things together. Then I was by him, as one brought up with him: and I was daily his delight, rejoicing always before him; Proverbs 8:27-30. Of course, Solomon in his book of proverbs, is speaking of wisdom, however I would not be a bit surprised if there is some double meaning to this verse. One important reason is the way God chose to create our world! It should be clear that God created things for Himself. All things were created by him, and for him: Colossians 1:16(last part). If we observe the things of His creation, we can see that God makes statements about Himself in His creations. He actually explains Himself to the whole universe by the things that He Himself makes. This must be so since that things He has made reflect that very fact. At one time, God must have been lacking something because He made us and the other created worlds. Why did God make us? Maybe that answer can be answered by the simple question: Why do we want children? When God made us, He gave us the same attributes that He has in Himself: love, loneness, creativeness, and free choice. We have other attributes which mirror God's attributes as well. God has given us the same power to think and act. He also has placed us at the head of this world which mirrors God's position in the Universe. It is important that we understand these ideas since they will help us understand the war between God and Satan. God has explained Himself to the whole universe by creating the world. Let's see the evidence. God creates a man in the image of Himself in a world of lesser beings. Then the man, Adam, finds that he is lonely on his own. He finds this out himself. In this God agrees, "Yes, Adam is lonely." It is only after Adam realizes his loneliness that God works to provide a mate for him. In this process God makes it very clear to both Adam and the watching universe that Adam would be lonely without Eve. When Satan rebelled, because he was not included in with God. He wanted to be like the Most High. So he began to make charges against God (this point is seen in all the text seen on this web page). Now God has to show the whole universe why Satan could not be included with God, so He created a world to show why. Satan could not even begin to understand or contribute to God activities like creating things. He himself is only a created being. Remember, there is an intergalactic government. God needed to treat this problem in such a way as to show to the whole Universe the real issues. God also wants the loyalty of the whole Universe. The very fact that God even talks to Satan in the story of Job should tell us that God is using Satan to teach everyone else, because everyone is listening! By creating our world God showed that even in the presence of all the angels of heaven and all the worlds in His vast domain, He could be lonely. God also is not able to share with us fully because we are just not able to understand. Neither do we have the power to act in creating. Adam illustrated the predicament that God Himself was in. Adam in the presence of the whole animal kingdom was still lonely and God made sure that all would understand this. The animals could not reason with Adam nor understand his description of his feelings. Even the presence of angels could not fully satisfy Adam's longing for someone like himself. Adam needed someone who could think like himself, who could have the same experiences as he. When Eve was finally created, Adam found that in his day to day living, he could share best with his wife the joys and plans that he had. She was his life's companion. In addition, the presence of the animals greatly increased the joys that they could share with each other. The animals could also respond in their own limited way with love to their masters. God actually created a microcosm of Heaven on Earth. Satan attacks Adam and Eve to get back at God! Satan wanted to be like the most high but he was not able to fight God's power, so He attacked the object which God used to show why Satan could not be God. From the story in Job, we know that Satan thought that if he could gain control of the inhabitants of the Earth that the planet would be his and he would have a place in the Universe. Satan was able to get Eve when she was away from Adam, and he caused her to fall, and then later, because Adam loved her more than anything, he caused Adam to fall. Satan has lost the war in that he was unable to convince the rest of the Universe to follow him. In addition he lost the war on earth since he has not been able to control those who have given themselves fully to the Lord. In addition, Jesus Himself came down and died for those who had fallen to Satan's temptations. So that who ever believes in Him will have eternal life. So we see that part of Satan's world has been redeemed. We now see that Satan's own rage is controlling him. He already knows that he has lost the war. His followers, a third of the original angels, have become devils just like him. They only seem to think and act in evil ways just like the one whom they chose to follow. There is only one sure end for them! And the angels which kept not their first estate, but left their own habitation, he hath reserved in everlasting chains under darkness unto the judgment of the great day. Jude 1:6. For if God spared not the angels that sinned, but cast them down to hell, and delivered them into chains of darkness, to be reserved unto judgment; 2 Peter 2:4. Satan's hatred of God and everything He has made has filled him with such rage that he will not stop until he is literally destroyed. Satan and his followers are doing everything they can to deceive as many as possible before he is finally destroyed. Remember, Satan ultimately wanted to rule in place of God Himself. He knows that he lost that possibility forever. He knows he is about to be distroyed! However even though he knows he has totally lost the war, he still wants to rule this world however short a time that may be. Maybe he still thinks, whether true or not, that if he controls everyone on our planet, that he can yet claim this place as his. His main trouble is that he finds out that he can not control everyone! In Daniel, Revelation, and elsewhere in the Bible, we see that Satan persecutes God's people. He even kills those who will not follow him. The Bible calls this the time of sorrows. It is the great time of trouble, or the great tribulation. Yet some last to the very end. Then shall they deliver you up to be afflicted, and shall kill you: and ye shall be hated of all nations for my name's sake. Matthew 24:9. But before all these, they shall lay their hands on you, and persecute you, delivering you up to the synagogues, and into prisons, being brought before kings and rulers for my name's sake. Luke 21:12. The next verse says that this war with the saints will end when judgment starts. The remnant in Revelation, standing for the Remnant of God's people is the same as the residue in Daniel. So when Daniel says: The fourth beast devoured, brake in pieces, and stamped the residue with his feet" Daniel is really talking about the persecution and destruction of God's people! OK, do we have any indication of why or when Judgement starts? Yes, Daniel gives us this clue as well. And they that be wise shall shine as the brightness of the firmament; and they that turn many to righteousness as the stars for ever and ever. Daniel 11:45; 12:1-3. This time of trouble is different than the earlier trouble where Satan was persecuting God's people. This time of trouble is the Armageddon or the battle over the mount of the congregation. The final battle between Michael and Satan before Jesus comes. Remember what Satan said very early on: "For thou hast said in thine heart, I will ascend into heaven, I will exalt my throne above the stars of God: I will sit also upon the mount of the congregation, in the sides of the north." Isaiah 14:13. We see above in Daniel 11:45 that Satan tried to sit down as God. When he did that he overstepped his bounds and God stands up and Armageddon starts. Its the battle over the mount of the congregation. This action is the beginning of the end for Satan and his followers. The following scripture describes the process. God will destroy Satan and his followers when His own people are secure. As can be seen from scripture above, Satan is placed in some sort of prison for a thousand years. During this time judgment is determined. The following scripture describes the destruction of Satan after the thousand years are finished. In the mean time Satan's people on Earth are resurrected so they can face their final destruction with Satan. Remember the scripture above which says: But the rest of the dead lived not again until the thousand years were finished. When Satan is released, the Scripture states that he goes out to deceive the nations. . . The nations must only be the wicked because we can see in the next verse that the saints are camped together in the beloved city. Also, we can see in verse 8 and 9, that the purpose that Satan has for his deception is to gather them together to battle the saints. Here in Revelation we see that Judgment commences and that God finally destroys Satan and his followers. The wicked that Satan had gathered together is destroyed by fire before they can do anything to the city or those in the city. They are all thrown into the lake of fire to experience "the second death". By the way, the phrase: "shall be tormented day and night for ever and ever" does not seem to agree with the phrase "this is the second death". If the fire burns for ever and ever, and they are tormented day and night for ever and ever; how does this relate to actually dying, the second death? I understand that the definition of the word that has been translated into, "forever and ever" does not have to refer to the specific action of the fire. The wicked don't have to suffer in the fire forever and ever; instead, "forever and ever" can be referring to the effect of the fire. The effect of being thrown into the fire lasts for ever and ever. They will die the permanent death that lasts forever. They will never be able to overcome the effects of the flames. They will be consumed. We must remember that language translation is not always an exact science. Instead the end result often depends on the opinion of the translator. The demons know what is coming and they tremble! Could man have gone to Mars and the Moon before the twentieth century? If we think back to how long it took for us to get to the moon, we might shake our heads. Because, it did not take long. 10 to 15 years is all it took. Its true that the space program didn't start in a vacuum, it was built on previous knowledge. How long did it take to gain that background knowledge? 500 years? Maybe a 1000 years? Of course most of the advances took place in the last 100 to 200 years. To me, a 1000 might seem a very conservative time frame to use. But of course conditions must be right for knowledge to grow. Sometimes books can be burned when churches decree that darkness is knowledge, etc. Is there any time in the past that might have been conducive for a creative learning process to actually proceed to the point where man could have reached for the planets in our Solar System? I think there was. If you look at my World Time Chart, you will see a time before the world wide flood where man lived for extremely long periods of time, almost 1000 years for each generation. After the flood something happened and man declined. Is it possible that man's abilities also declined with the decrease in lifespan? The Bible pictures nature as running down or declining in complexity. This decline in complexity could have had a number of outcomes. Imagine what science would be like if a scientist was able to work for 500 to 700 years or more rather than 40 years. What kind of knowledge could be gained within that time. Also, if the IQ of these early scientists were higher than ours, say two times, what would we expect? What about ten times (I take this from the difference in lifespans), we might expect an ability to make structures on other worlds of the stature of the monuments of Mars and the Moon. Even with no increase in IQ, the fact that the same researchers can work on project after project for hundreds of years can greatly speed up the process. In our day, every 40 years or so, we have a changing of the guard. We must start over, as a new generation must completely learn what was done before them. I think that man could be the author of the structures we see on both the Moon and Mars. There could also be a twist in the story. Why is it that on the Sphinx in Egypt and the face on Mars, is there both lion and human components? I wonder if the puzzle could represent a coalition between man and Satanic power? I can't stop wondering whether this possibility is true or not. Could these powerful beings (Satan and his followers) be the source of the UFO's? Are We Reverse Engineering UFO's? There are some very interesting stories floating around that suggest the possibility that the military has in its possession UFO's. Stories like Roswell are well known and have quite a following; However, it happened so long ago (1947), and the stories have gotten so wild, that it is very hard to determine what happened. What has caught my attention are the stories that the government is trying to reverse engineer what they have captured. Two different strategies have surfaced: One is that the military is trying to reverse engineer the actual UFO mechanism for flying. The other is that the US has started a commercialization project allowing our technology to leap forward at an amazing rate. Look through the following links to see what the stories indicate. Morphing Metals Is this back-engineered Roswell debris? It is possible that the various technologies that are being reverse engineered from actually hardware that was made and used by man from before the flood? Man was probably much more capable at that time in developing the technologies needed for traveling through space. However, because of the possibility that man was in direct league with Satan, the evil angels could have also taught much of the technology known by early man. The half lion half human structures found in Egypt and Mars speak of the possibility of some joining of powers. As evidenced by various studies of early man (after the flood) on such places as stone henge and Egypt, it is clear that there was some knowledge of things which we no longer know today. For some time it has been common knowledge that most of the major libraries of antiquity were destroyed. So today, most of the original ancient knowledge has been lost. If much of our present technology was regiven to us by Satan in our time, then we must suspect that he must have had a specific reason for giving it to us. Much of the book of Revelation describes the actions of Satan. In it, we see Satan wanting to take over the world. If man has computers capable of keeping track of all the people of the world for the purpose of controlling them. It seems very likely that if it is true that Satan has provided us this knowledge, then he most likely gave it to us for the express purpose of making it easier for him to take over the world. How would we be able to tell whether UFO's are from devils or beings from other worlds? A very interesting question. How would we be able to tell if Satan is pulling off a masterful lie against all of humanity? Or whether the UFO's we see are really from another world? Presently I don't think there is anything they could say or do to show that they are really from other worlds and not Satan and company. There is no way to tell the difference. The only sure way is to monitor how the phenomena progresses in the future. Do these beings like to be destructive? Could they in the future be involved with promoting Satan as king of all the Earth? If the UFO phenomena helps Satan to sit down as God on Earth than know for a certain that the UFO phenomena is the workings of Devils. For instance, the present ET's could reign havoc on the Earth, only to be forced away by another ET group which would present itself as a good race with high moral values. The new ET group could lay the groundwork for putting Satan in direct physical power over the Earth. Another scenario might be to have all UFO's to try to bring a Christ to Earth only to be discovered as the fake, than a "real" Christ could appear. He could appear as more religious, but his ultimate purpose will be to take over the Earth and rule it. Only this new Christ is actually Satan. How can we know the real Christ from the fake? Satan will try to set up his power on the Earth. Jesus, on the other hand will not even touch the ground. Fearful Sights in the Heavens! The Bible speaks of fearful sights and great signs in heaven (meaning from the sky). I think that the fearful sights and great signs don't have to be natural events. Comets or asteroids slamming into the Earth could very well be a part of the prophecy; However, UFOs, the face on Mars, and monuments on the Moon could also be perfect fulfillments as well. There are many people who have seen UFO's and one day at work they get a buzzing in their ears. The same noise they heard when they saw it and they call up their friend to find that they also hear the same buzzing. So they go out hoping that it will come back and possibly communicate with them. This is a very dangerous thing they are doing and they are not about to be easily persuaded not to pursue these things. We will see more supernatural events as we get nearer to the end of time for this world. I think that Satan and his followers are behind many of the paranormal phenomena that exists in the world today. A list of their activities might include: the UFO phenomena, abduction program of ETs, Animal mutilations, Crop circles, Astroprojection, Big Foot, Ghosts, possession by devils, Master guides; as well as the phenomena described on this page; The face on Mars, and the ruins on the Moon. Some time ago, there was a TV special on Big foot. A lot of experiences were told including the evidence surrounding the various stories. One story made a deep impression on my mind. A man out in the open was walking down a road when all of the sudden there was a lot of noise and when he looked up he saw a big foot running straight for him. There was a house near by and he ran for the house. It was so serious that he wasn't even going to knock. He was going to run in and close the door. But the owner of the house saw what was coming and quickly locked all the doors. He tried to open the door but could not. Then it came up and stood over him making hideous noises. In complete terror he fell to the ground and closed his eyes and started to pray to God. Before he knew what had happened, the thing was running the other way. The very instant he started praying to God, it turned and ran! The answer to that prayer was immediate. Satan would want us to think that other worlds are visiting our world. This would allow him to work undetected. In addition it is a way to approach man that appeals to the masses. It would allow him to assume as fact, many things which do not agree with the Bible. How is Satan going to use his cover-up advantage? If Bible prophecy is true at all, he is going to come to our world officially as a being of light. He will come to personate Jesus Christ. I also think Satan could use the present popular view of ETs and space exploration using space ships of various kinds to make the idea of his coming more popular in the world. It would be an overriding surprise as well as being an effective cover to deceive the whole world! A friend wrote this, I think it is a very good possibility! From now until Jesus comes, you should expect an increase in UFO activity. Soon, I cannot say whether a month, a year or more, but soon you will hear reports of UFOs appearing, simultaneously above major cities of the world. Watch: soon SETI scientists, astronomers and government officials will announce that they are receiving intelligent, decipherable messages originating beyond our solar system. These messages prove, they will conclude, that intelligent life exists on other worlds and that the messages being received are apparently reaching earth from a friendly and peaceful race. Soon thereafter, announcements will be made that 'visitors from other worlds' are coming to earth to meet with government and spiritual leaders representing several nations. What a wonderful story they will tell: "Our civilization is much older and far more advanced than yours. We have learned to live in peace on our world(s). We want you to experience peace on your planet too. Of course we have been visiting your earth for hundreds of years, taking note of your evolving social and scientific accomplishments. But we see many things happening on your planet presently that could destroy all life on earth. Unless you (the people of earth) come together in harmony, your planet is doomed. We are your friends and we are ambassadors of peace and good will to all the people of earth." It won't be long now, millions, perhaps billions of human beings will very soon, with the naked eye, observe these alien craft. Likely billions more will see and hear of them via television and the popular media. These "aliens" will speak of the Bible, the Koran, of Jesus, of Mohammed, of Buddha, of certain human beings that evolved spiritually and, at death or translation, came to live with them on their exalted worlds. Stepping out of these other-worldly craft, you, or people you know, may expect exact copies of "loved ones" or friends that allegedly have died, but supposedly are still alive (actually morphed evil spirits) to appear, and they will relate intimate, personal details calculated to deceive. These so called "alien friends" will speak of "the universal Christ" and announce to earthlings that HE is soon returning to earth. But first, they will say, men and nations must ready themselves by making peace and coming together in harmony. Be prepared for revered Bible personalities to return to earth and step out of UFOs! They will claim to be Apostles, Prophets, Saints, deceased- yet-alive friends and loved ones, but THEY ARE LIARS. THEY ARE DEMONS AND THEY ARE COMING "TO DECEIVE, IF POSSIBLE, THE VERY ELECT!" ...Blessed is he that watcheth..." Rev. 16:14, 15. If you are not aware what the Bible has to say about what happens when people die, please click on What happens when people die? Where do they go? Is death permanent? To learn more on the legal strategy that Satan is using to attack the Ruler of the universe, please click on The Legal Battle What are the rules of the war? How is it going to end?